Women's stories often get lost because so much of women's history resides in private places such as diaries, family scrapbooks, family letters, or papers stored in boxes in family attics. Women often are hard to find, and once found, can be hard to track over time as they change their names when they get married. And sometimes they marry more than once, which increases the challenge. This was what fourteen Fort Worth women took on when they agreed to write a chapter each on the history of women in their city. 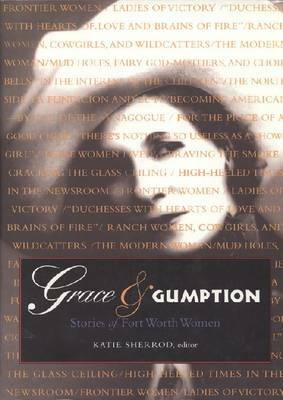 From pioneer women to the movers and shakers of the mid-twentieth century, "Grace and Gumption" explores the lives and careers of the prominent and not-so prominent alike, uncovering a fascinating web of connection to show readers just how bustling Fort Worth was shaped by the distaff side. Early in the process of planning the book, certain parameters were needed: from choosing the themes or categories of women's endeavors to deciding where to draw the line for inclusion. To avoid problems of inclusion and omission, the contributors agreed that they would only write about women who are deceased. Developing the categories to assign was difficult, because you can't pigeonhole women. Women always have been multi-taskers and many were relevant to more than one chapter because their talents and contributions reached in many directions. Over the course of a summer, contributors met at monthly gatherings to discuss their progress. Meetings often concluded with authors bargaining with one another over who "got" which multitalented woman. The goal was not an encyclopedia but to gather as many women's stories as possible out of the attics and into a public place, to provide snapshots of women's contributions that others may one day enlarge upon. In the process, contributors learned a whole lot about the growth of a city and became a small and close-knit community themselves. The result - a labor of love by women for women.